For all his dismal approval ratings, President Obama’s latest fundraising numbers for his re-election campaign prove he can still rake in the bucks. And it’s not just the deep-pocketed who are giving—Obama’s still receiving small-dollar donations from grassroots donors who, despite his struggles, appear to be standing by their man. Although small-dollar donors—people who gave $200 or less—comprised less than 10 percent of GOP frontrunners Mitt Romney’s and Rick Perry’s fundraising between January and September of this year, nearly half of Obama’s haul was from small-dollar donors, according to an analysis by the Center for Responsive Politics (CRP). That’s a higher percentage of small-dollar giving than Obama’s vaunted $750 million money machine from the 2008 campaign. 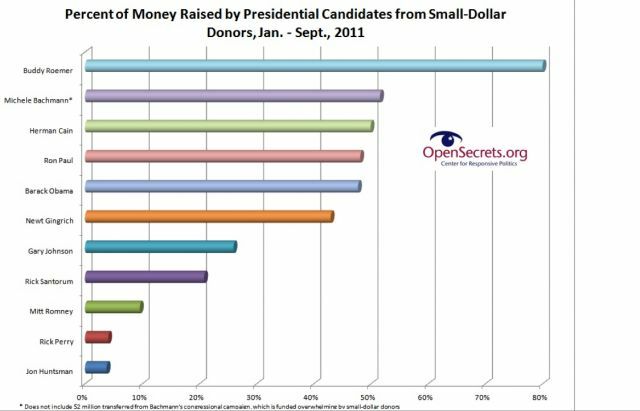 In fact, during the last campaign, small donors never accounted for more than 40 percent of Obama’s quarterly total. All told, Obama has raised $41 million from small donors for the 2012 campaign. Where Did Obama’s Mojo Go?